You make a Popup control visible by setting its IsOpen property to true. By default, the popup will then stay open until you set the IsOpen property back to false. 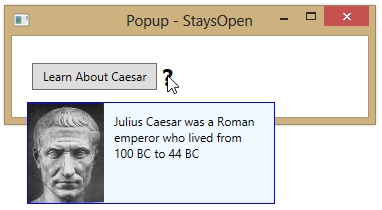 You can also set the popup’s StaysOpen property to false, which causes the popup to close as soon as the user clicks anywhere else in the application (outside of the popup’s boundaries). In the example below, we set IsOpen to true in a MouseEnter event handler. But we’ve set StaysOpen to false so that the popup automatically closes whenever we click on something outside of the popup’s boundaries.